The uniqueness of Aiki Bukikai is the link between barehanded techniques and weapon techniques. Aiki-ken and aiki-jo are based on the same principles as taijutsu techniques. 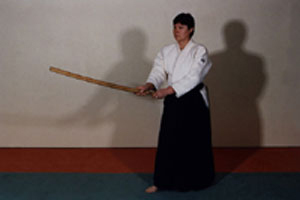 Aiki-ken is therefore different from other Japanese sword styles. Iaido, kendo, kenjutsu, and aiki-ken to mention just a few are all fundamentally different schools. Bare-handed techniques are essentially defence techniques resulting in pinning or throwing. All techniques employ the same principles such as use of the hips to gain power without muscular effort or circular movements to control the partner. These principles allow you to use the techniques on heavier or stronger partners, or opponents. The weapons used in Aikido are the bokken (or ken), the jo and the tanto. The bokken is a wooden training sword which replaces the real katana. The sword used is therefore different from the shinai made from strips of bamboo used in kendo and from the iaito used in iaido. Oak is used to match the weight of the katana and to have the solidity required to work with a partner. The jo is a 1.28m long staff with a diameter of about 25mm: diameter depends on user preference. It is also made from oak. The tanto is a knife with a blade about 20cm long. It is usually made from wood for training purposes. It is mainly used for weapon removing practice. Suburis are simple movements which are repeated continually to learn how to handle the weapons and to develop the right body posture. The kumi-tachi (with the ken) and the kumi-jo are exercises with a partner focusing on accuracy, distance (ma-ai) and timing (awase). iller la précision, les distances (ma-aï) et le timing (awase). There are many other work forms such as ken-tai-jo (defence with a jo against a ken attack) or jo katas.